The top map shows the location of Capena in relation to Rome and the airports at Fiumicino and Ciampino. Beneath that is a street map of Capena, showing the locations of the two Casa Capena properties. Both maps can be dragged and zoomed. However, if you zoom in on the old quarter of Capena (on the left side of the street map), be warned that some of the labelling can’t be trusted. * All those alleys and stairways must have confused Google’s mapmakers. Technical constraints prevent the use of differentiated markers on the street map but Casa Galilei is the one nearer the left edge and Casa Marconi is the one nearer the top. Apologies if both have disappeared off the left side of your smartphone screen but the map is centred on Capena’s focal road junctions. * The correct street names of the old quarter are shown on the home-made map below. To be more precise, in some cases the map shows the short versions of the correct names: Via Galilei is actually Via Galileo Galilei, Via Marconi is Via Guglielmo Marconi, and so on. 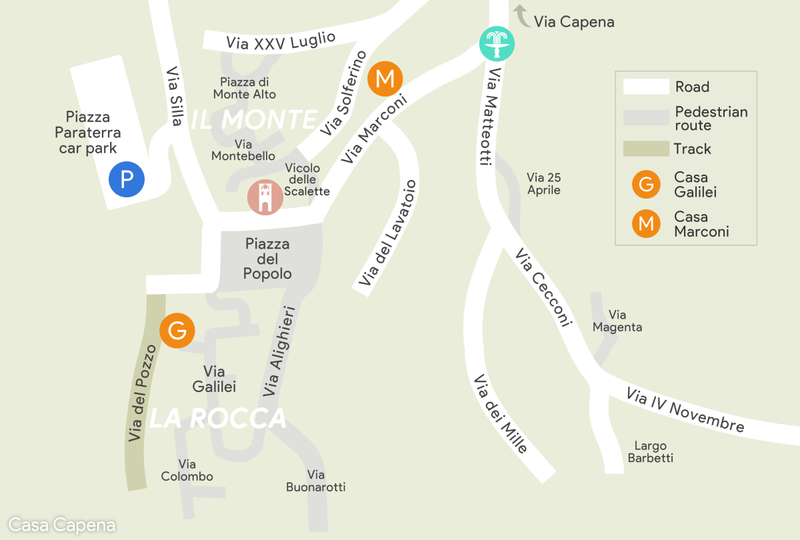 The map also includes the Piazza Paraterra car park and icons for the fountain and clocktower.